YMCA St Paul’s Group works with young people to provide a safe place to stay and to help them develop their potential. But that’s not to say that we don’t serve older members of the community, too. 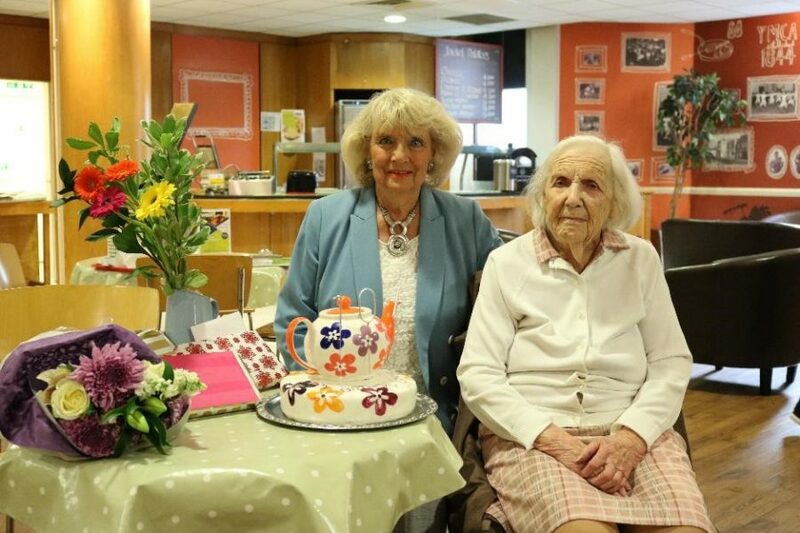 YMCA Surbiton was honoured to host one of our Teapot Club members’ 104th birthday party. Grete Grey celebrated in style with a beautiful cake, gifts and flowers along with her friends in the Teapot Club. Grete lives in Chessington and came to the UK back in 1939 aged just 25, as it was unsafe for her to remain in her native Denmark during the Second World War. She first lived in Claygate and worked as a cook. Fit and healthy, Grete walks every day to keep mobile. “I make sure I get up and move about, I don’t go far, but I do like to go for a walk,” she says. With the support of all her friends and neighbours, Grete gets by quite comfortably. The Teapot Club has around 15 members but welcome anyone of retirement age. “YMCA has always supported the elderly in the community, and our Teapot Club is a great way for people who are on their own to get out and meet people,” explains Joyce. “We hold a raffle each week, and always have a great Christmas party”. The Teapot Club runs on Wednesdays, 2.30pm-4pm at YMCA Surbiton, 49 Victoria Road, Surbiton KT6 4NG. Newcomers are very welcome, just drop in to the café and ask for Joyce.